This was one of the last remaining challenges. Since 1915, adventurers, explorers and polar travellers had dreamt of crossing the Antarctic. Many had tried, and equally many had failed. Børge Ousland was one of these. Still the dream persisted. In November 1996, polar travellers from four nations stood at the edge of the Antarctic ice, filled with a vision of a distant goal. Never before was there such a race for the world's uttermost destination. Only one man was to make it. 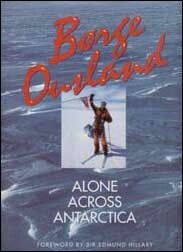 On 17th January, Børge Ousland unbuckled his skis, and entered Scott Base situated deep within the Ross Sea. At the same moment, he also entered polar history. No other person of our modern age has undertaken so many polar expeditions with such success. The readers of this book are introduced to a man who does not waste words on his great accomplishments. They are not overwhelmed by an abundance of ice and cold, toil and hunger. Rather are they able to imagine themselves in his place, about to set out on a journey - be it on a smallor grand scale.